"Romney is the opposite of conservative, with a plan that is fiscally reckless and a foreign policy that is unnecessarily militant. Obama has done about the best that could have been done, considering the united GOP opposition in Congress. My questions about Obamacare and my disappointment that we are not already out of Afghanistan are not enough to make me embrace a candidacy that even George W. Bush would have been repelled by--and, having had time to reflect on his own record, perhaps is." While at Fox, Glenn Beck would contrast the presidency of moderate Bill Clinton with that of supposedly "radical" Barack Obama. Beck, many others at Fox, the far-right in general and Governor Romney have been smearing this President since his inauguration in January of 2009 with most trying to paint Obama as out of the mainstream, even "un-American." This post of merely 11 paragraphs is to serve two purposes: 1) to make it clear in four paragraphs, by using the statements of trusted leaders including two Republicans, that President Obama is not the "radical" Marxist, Maoist, fascist, socialist president that Beck has been painting him as with his deceitful, yellow propaganda and 2) to provide in the other seven paragraphs an opportunity for undecided voters, who may have been watching the Giants v Cowboys game or working during the Democratic Convention, to hear the speech President Clinton gave in support of President Obama and weigh the opinions of conservative Wick Allison (above) and former FL Republican Governor Charlie Crist (below) before deciding whom to vote for. Two points from the Big Dog's speech are worth pointing out so far as they concern Beck and the far-right. Clinton referred to an "alternative universe" of Republicans who have been attacking Obama. That would accurately describe Glenn Beck's extremist world-view as well. Like many on the far right and far left, Beck has an understanding of the world in general and politics in particular that are not shared much beyond his following. We all assimilate reality through a "tint" of our values, and Beck has reactionary (far, far-right) values that reflect the Gilded Age of elite's great wealth and the mass poverty of employed workers of the late19th Century. The backlash to that era created the Progressive Era in American history. The second point that Clinton made relevant to Glenn Beck is when he explained that the "far-right seems to hate our President." 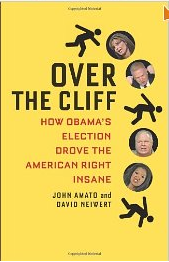 Beck is hardly alone in this hatred, but he is helping lead millions of reactionary Americans over the cliff of reason and respect for the Presidency into the pit of hatred, lies and a form of insanity as explained by John Amato and David Neiwert. Perhaps most important for anyone concerned about the economy and the national debt is what Clinton addressed most emphatically. Arithmetic. The numbers in Romney's budget do not add up to deficit reduction. Incidentally, one of the flaws in Clinton's speech regards Republicans supporting some modest tax increases. Most Republicans have signed the anti-tax pledge of reactionary Grover Norquist, but a few have--at least for some time--supported some modest tax increases. Also, during this campaign, the Obama campaign's attacks on Gov. Romney have been more personal than Romney's have been on the President. However, Clinton was correct when he argued that President Obama has been trying to cooperate with a Republican Party hell bent on making Obama a failure. The "united opposition" that Wick Allison referred to has another name: obstruction. The Democrats also had former FL Governor Charlie Crist, a Republican, speak in support of the President as evidence that the Beck-allied, Tea Party-infused Republican Party has become so extreme, so reactionary, that moderates like Crist have been forced out. If President Obama were the extremist, "Marxist" radical that Glenn Beck has been painting him as, would his re-election campaign be supported by conservative Wick Allison and moderates Governor Charlie Christ and President Clinton? Of course not; Glenn Beck, and the rest of the far-right, are full of bologna! This election is a choice between going forward toward shared prosperity or going backward, the direction preferred by Glenn Beck and his "soulmate," Congressman Ryan. The economy is likely to recover faster, going forward, no matter who is elected. That is what capitalism does. It's called the boom/bust cycle, and we're coming out of a severe recession. It took much longer than four years to come out of the Great Depression, and that only happened when boosted by the massive government, deficit-financed spending program called World War II. If voters want to accelerate out of the Great Recession faster, that will take more government spending for education and infrastructure, whether funded by taxing the wealthy or by more borrowing. Less government spending means a slower recovery; it's that simple. The national debt will begin to come down as more people go back to work and pay taxes rather than collect unemployment insurance and food stamps to get by. The debt will come down even more if the millionaires and billionaires, Mitt Romney's base, are taxed at a rate commensurate with their greater ability to pay more as Obama proposes. The tax cuts from the last 30 years have benefited them so much that they have enough stashed away in offshore accounts to pay off the entire national debt! Lowering taxes on the wealthy does not "trickle down;" it goes offshore. Just examine Gov. Romney's tax return. That's where he has stashed his extra money, and he is hardly alone. Remember, when Republicans claim "We built this!" they are referring to most of the national debt that was on display during their convention. They built most of that! Wick Allison, above, conveyed the truth about Republicans in Congress. No matter who is President for the next four years, he is going to need a Congress he can work with to get legislation passed and problems solved. Therefore, no matter who you vote for, it would be most helpful for the nation to vote straight Party line. We need a unified government to pass bills and solve problems. Divided government is dysfunctional or nonfunctional. If you, undecided voter, want to avoid the fiscal recklessness mentioned by Allison and get the country moving again, the choice is clear. The Republican Party is no longer conservative; they are becoming reactionary. They want, just like Glenn Beck, to go backward. The clear choice for everyone, who wants to get the United States on top economically and moving forward toward a "more perfect union," is to vote for Democrats. If you are undecided and voted for Bill Clinton in 1996, take it from the Big Dog himself and don't buy the Republican lies that you've heard and will continue to hear in the coming weeks. "Governor Romney and his allies are hell bent on taking President Obama down. And you better believe they're going to spend -- and say -- whatever it takes to make that happen, even if they have to make it up, like the phony attacks charging the President with weakening work requirements for welfare or the charge that he plundered Medicare, when in fact he added eight years to its solvency and closed the doughnut hole in the drug program!" If we're going to solve problems, a President needs a Congress he can work with, and Republicans have proven that they are unwilling to work with Obama. That is why it is important for voters to cast straight party-line ballots. Vote for Democrats or vote for Republicans which would be a disaster for the middle class.